Later in 2012, following the sale of the mules in the Paul Rousseau collection, this pair of Marie-Antoinette's shoes were offered at auction. They fetched a even more impressive 50,000 € (though, as Time pointed out, this was some way short of the record for an item of clothing, which belongs to Marilyn Monroe's "Happy birthday Mr. President" dress which sold for $1,267,500 in 1999!) The buyer was undisclosed. Perhaps there is a Russian tycoon out there with a lot of old (and very expensive) shoes! Lot 20: A pair of green and pink silk slippers which belonged to Marie-Antoinette. 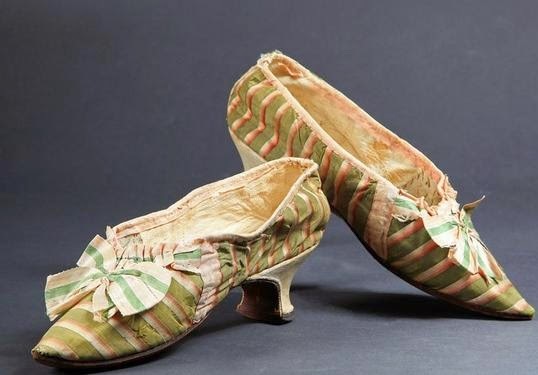 The shoes were given in 1775 by Marie Antoinette to Alexandre-Bernard Ju-des-Rets (1752-1837), an officer in her service at Versailles and were put on sale by one of his descendants. They are similar in construction to the Toulon mules with wooden heels covered in white leather, but they are in even better condition. 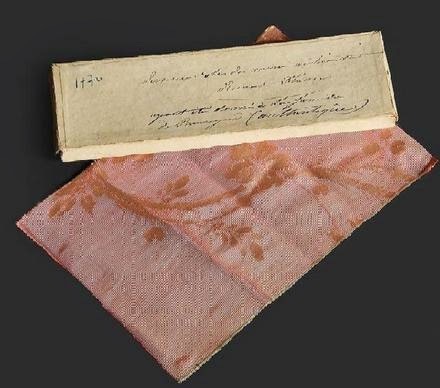 Lot 34: Framed sleeve of a cotton tunic worn by Marie-Antoinette in the Temple. Nice blog! Indeed, I'm looking for different designs of shoes because I'm planning to collect various kinds of shoes. I started a few weeks ago and until now I'm looking for beautiful shoes. When I saw your blog, I noticed your shoes and I liked it very much. Thanks!